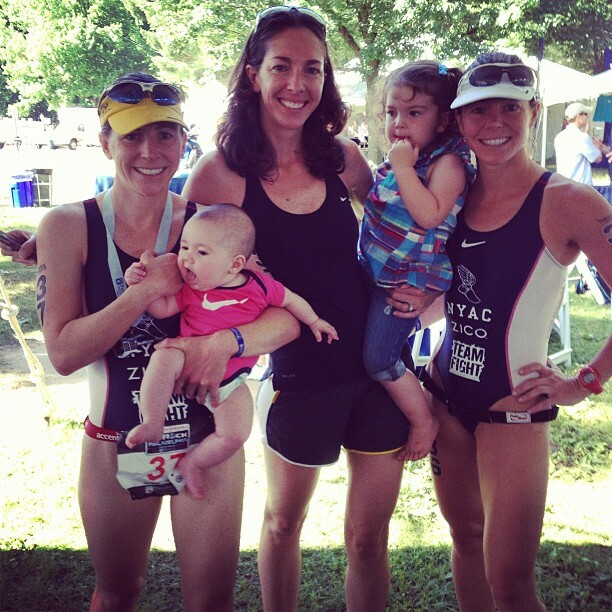 Yesterday, the day Amy turned five months, I returned to the world of professional triathlon after an 18 month break. I couldn't have asked for a more welcoming environment to jump back into racing than the Philly Triathlon. Everyone one was so supportive and even though I didn't win the race, the fans made me feel like I was their champion. Before I go into details about the race, I need to thank two superfans, my sister Sarah and my two year old niece Nora. They drove up from Maryland at 4:30 a.m Sunday morning, cheered at the race, and then drove right back down to meet the rest of the family at the afternoon Nationals game in DC. 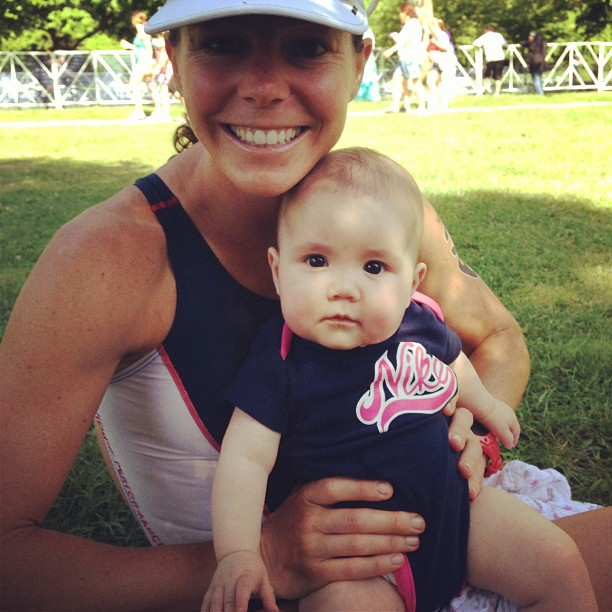 Sarah, who, by the way, also has a 5 month old baby, has been a faithful cheerleader at just about every Philly Tri. She also knows first hand what it's like to get in shape after having a baby, so she wasn't going to miss this big event. As for the race, I finished sixth, with a time that was several minutes behind the winner, Angela Naeth. This was by far the least speedy performance I've had, but it was probably the most memorable. Going into the race, I didn't know what I was capable of. I honestly thought that just finishing the race would be a really good day. Then, a few days before the race, I thought, well maybe I can be competitive enough to beat a few people. The day before the race, I changed my tune to, maybe I can get in the top 5. Never mind the fact that I'd only been training (at a very basic level) for three weeks and my longest run before the race was a five mile trail run. But given the chance to be competitive, I couldn't resist. Amy and Laurel hanging out after the race. 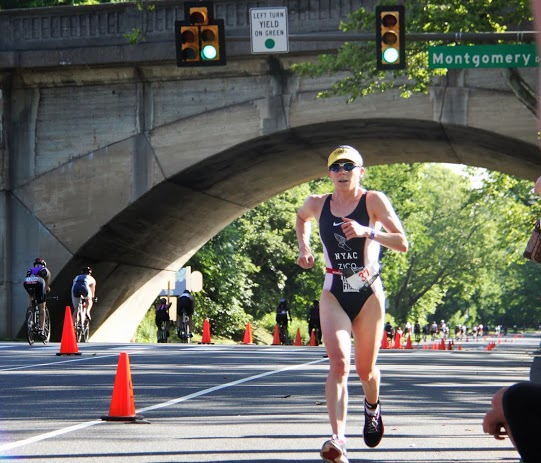 On race day, I was actually competing for the podium during the swim and the first half of the bike, until my limited training time began to take over. I ended up riding a 1:06 and my fastest on this course is a 1:03. I felt strong for almost the entire first loop of the two lap course and could see Laurel ahead of me off in the distance. But I just couldn't hold the pace after about 10 miles. I rode my Cervelo S5 road bike and felt great powering up the hills and motoring through the technical sections. The flat, pure time trial sections of the course were where I lost time. Time trial interval in the aerobars are now on my to do list! I was in fifth place when I started the run, but got passed at about the two mile mark. I wasn't running very fast and my scar was painful. This was distracting and unexpected because it didn't bother me in any of my previous hard runs (all three of them!). After I got passed, I just tried to run at a comfortable pace because there was no sense risking an injury when I had 6th place locked up. As a result, I turned in a 10k time that leaves a lot, more like a TON, of room for improvement. Sarah was waiting near the finishing chute and handed me Amy so that we could cross the finish line together. If anyone out there took a photo of this, please let me know! 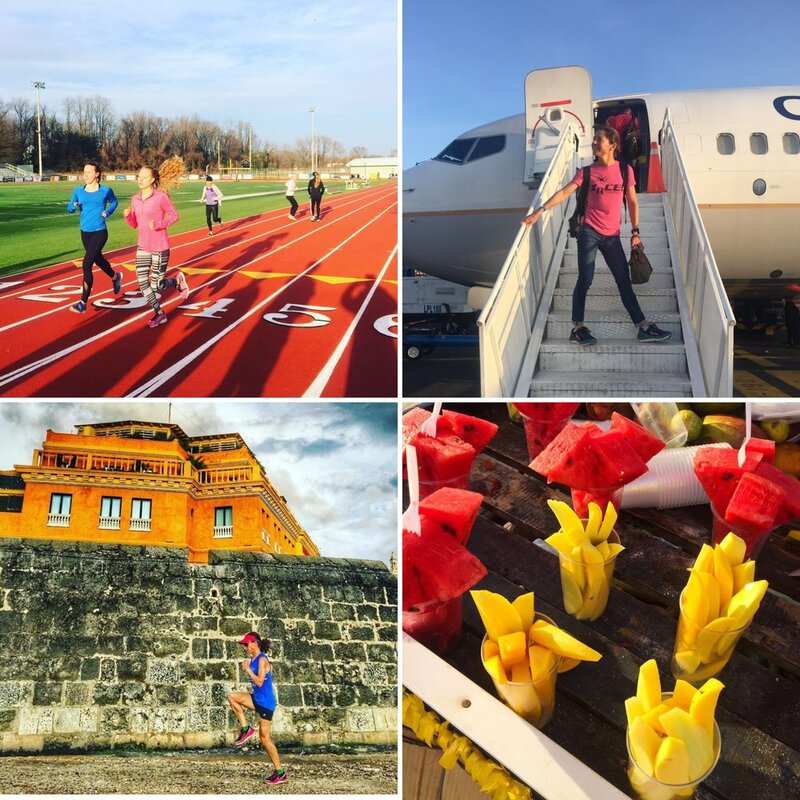 At that point I realized, the time and my finishing place didn't matter, just finishing the race five months after having a baby was enough of an accomplishment. The race served as a good benchmark of my fitness level. It got me fired up to see how much I can improve over the next weeks and months. But the best part of the day was being a competitor in a triathlon and not just standing on the sidelines. My next race will be the New York City Triathlon on July 14.